An infrared security camera has infrared lighting (light from a different region of the electromagnetic spectrum than we normally use to see) installed around the outside of the lens of the camera. This lighting allows the camera to capture a good image in no light at all. With a little bit of light (called low light) the infrared camera can capture a picture that looks just like daytime. People use infrared security cameras for businesses that have the lights out at night (in case of break-ins). Or for outside, nighttime viewing. Keep in mind that even at nightime there is a normally some light from the moon, stars, or street lights. Infrared cameras are often called "Night Vision" cameras because they can 'see' at night. However, do not confuse "Night Vision" with "Day / Night Cameras". Day / Night cameras do not have infrared lights built in. More about those types of cameras below. A common problem with infrared cameras is that they do not do well in outdoor housings because the infrared light reflects off the glass of the housing. Some people get acceptable results if the camera is absolutely flush up to the glass thereby reducing the glare. An alternative solution is to use a day / night camera which has an extra sensitive imaging chip that allows it to capture a good picture in low light situations without using infrared lighting. This works well for example if there are street lights outside or an exterior light that can be left on at night. Keep in mind that cameras without infrared lighting will not capture an image with zero light. The level of light required to capture a good picture is referred to as a camera's lux, the lower the lux the better the camera can see in the dark. For example a camera with 0.003 lux is better than a camera with 0.2 lux. Infrared cameras are also compared by how far they can see in total darkness. 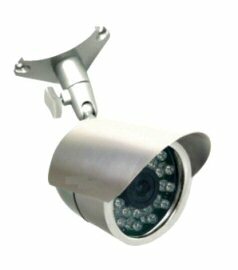 Our Color Outdoor 50 ft Infrared Camera can see up to 50 ft. with no light at all! The image that infrared cameras capture is black and white - however some cameras will capture color images during the day when light is available and will automatically switch to black and white when light is low. For example, see our High Resolution Color Weatherproof High Resolution Infrared Camera or our Color Armor Dome Infrared Security Camera. This feature gives you the best of both worlds!